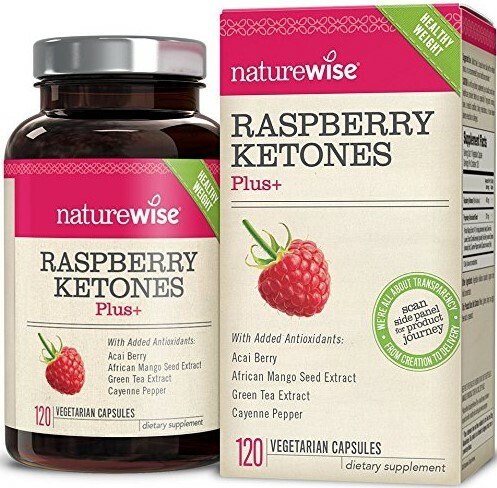 If you've been struggling to lose weight, raspberry ketones may be the answer to your woes. Certain types of berries, kiwifruit, peaches, apples, grapes, rhubarb and bark from maple, pine and yew trees all contain the chemical raspberry ketone. Its popularity is largely contributed to a feature on the Dr. Oz show in February 2012. Dieters blame a slow metabolism for all sorts of problems that they encounter when trying to lose weight. While a slow metabolism is a real thing, it's an extremely rare condition that affects much less than one percent of the population. Raspberry ketones are said to increase the so-called fire within and speed up your metabolism in an incredible way. More likely, the positive effects of raspberry ketones that so many people rave about are due to a hormone called adiponectin. This hormone has been found to increase the rate that the body burns fat and it also reduces appetite. For someone who is on a ketogenic diet, the ingredients in any supplement that is taken are critical. Your success may become hampered by supplements that have hidden carbs, glucose and other threats to your diet. Since the FDA does not regular supplements except in extreme cases, consumers must make their decisions carefully. Unless you have your own testing lab, the best way to determine if a supplement contains what it promises is to ensure that the supplement uses a third-party and respected independent laboratory. While you can find raspberry ketones in most major health food stores, the best selection is available online. This is one product that is subject to scams, so it's important you get your supplement from a verified and trusted source. While raspberry ketones can be found in a variety of foods, you'll find it's most prominent in red raspberries (Rubus idaeus). Its effect on the body is similar to the way that hot peppers act. By altering lipid metabolism, which is the body's ability to break down fat stores for energy, limited studies have suggested that it has a positive effect on weight loss. In addition to weight loss, many people take raspberry ketones to prevent hair loss. Male pattern baldness may also be treated with the application of a raspberry ketone solution to the head. While studies are limited on the efficacy of raspberry ketones, there have been promising studies that show it is effective for hair loss, hair growth and obesity. In the studies, raspberry ketones are taken with vitamin C and caffeine. The supplement used in one randomized controlled trial took 70 overweight men and women from 21 to 45 years of age and provided then with a placebo or weight-loss product. The product contained 2,000mg of raspberry ketone, caffeine, bitter orange, garlic, ginger, cayenne, L-theanine and pepper extract. It also included B-vitamins and chromium. The study lasted 8 weeks and reduced their caloric intake by 500 calories from a standard diet that was suitable for their current weight. Those taking the supplement lost an average of four pounds. The product should be taken orally for weight loss. It's best to take the product along with your other vitamin and mineral supplements. Many products will add extra ingredients, so it's a good idea to find one that only contains raspberry ketones. You can then take it alongside vitamin C, B-vitamins, chromium, L-theanine and bitter orange to get the best benefits. While there is no recommended scientific dose, you should aim to follow the dosage used in the study by breaking your dose into 1,000mg doses twice per day. This may mean taking more of pills than recommended on your particular supplement, which is also why it's a good idea to get a pure raspberry ketone supplement. This way, you don't have to worry about ingesting too much of another ingredient. There are no known side effects documented in the scientific literature. If there are side effects from a particular product, it's likely due to the manufacturing standards of the product or another ingredient in the product. Raspberry ketone is chemically similar to synephrine, which means that it could cause jitters, increased blood pressure or a rapid heartbeat. While there is no evidence that the supplement is harmful to women who are pregnant, it's best to err on the side of caution. If you're obese during pregnancy, you should consult with your doctor to find proper remedies. People who have diabetes must carefully monitor their blood sugar levels if they intend to take the supplement. It may cause your blood sugar to drop to a dangerously low state, but there is no research to validate this potential. Start with a single dose to see how you feel and monitor your blood pressure using an inexpensive monitor while you're taking the supplement. There are often free blood pressure monitors available in pharmacies and health food stores. However, it's important to get a baseline so you know what your blood pressure is before and after the supplements. Accomplish this by taking your blood pressure daily for a week so that you can account for normal fluctuations. As you wait for your item to ship, you can begin building a baseline. Our top pick is aSquared Nutrition Raspberry Nutrition primarily because it's the only safe option that doesn't include extra ingredients. If you want to take a lower dose of the product, then some of the other options might work for you. However, this one provides you with just the raspberry ketones, which means you can supplement this product with the other vitamins and minerals that you need. When you buy a supplement, it's tempting to go with the supplement that has the most ingredients. By purchasing your supplements piecemeal, you'll get a far more potent effect. This product is made in a safe facility that is FDA and GMP approved and certified. Get this product if you've tried other supplements and experienced side effects. Contains only raspberry ketones at an effective dose. Made in GMP Compliant facilities. Contains no fillers, binders or harmful preservatives. Dosage is two capsules, but you get the recommended 1,000mg per dose. Specifically designed to enhance weight loss efforts, this product includes a proprietary blend of ingredients that are designed to support the main ingredients. While the product doesn't state the specific allocation of each supplement, you should be able to effectively double your dose to get close to the recommended dose used in studies. The NatureWise supplement includes valuable polyphenol antioxidants to help combat free radical damage and oxidative stress within your body. The product has been third-party tested, and it contains ingredients that are both vegan and gluten free. The product uses a vegetarian capsule. Includes ingredients that help support weight loss. Added ingredients make it hard to titrate the dose very high. Green Tea Extract may increase anxiousness. 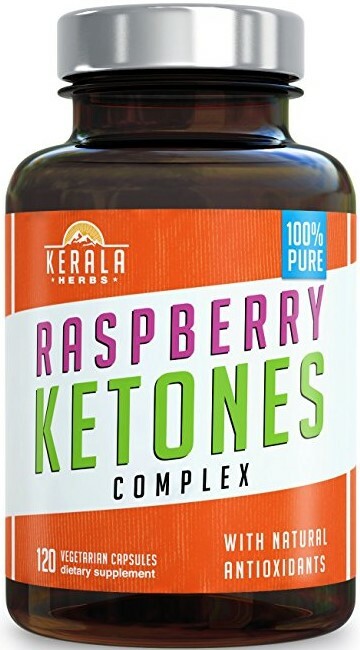 If 500mg of raspberry ketones works for you, then this supplement offers a good value. The dosage is two capsules, which is a bit high for a supplement that only contains 500mg of raspberry ketones. However, when you consider the other ingredients that are included, the dose if pretty reasonable. 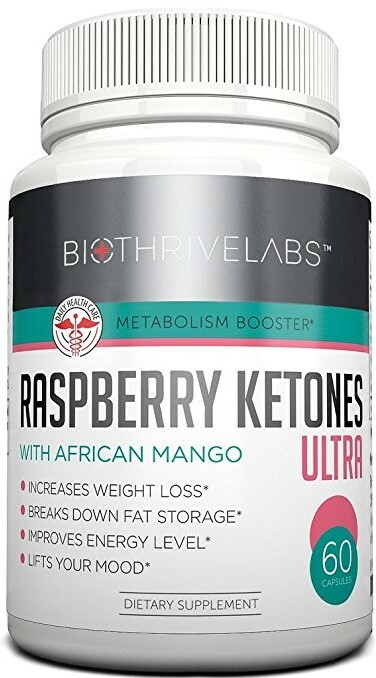 One concern about this supplement is that there are only 500mg of raspberry ketones while the additional ingredients account for 700mg. 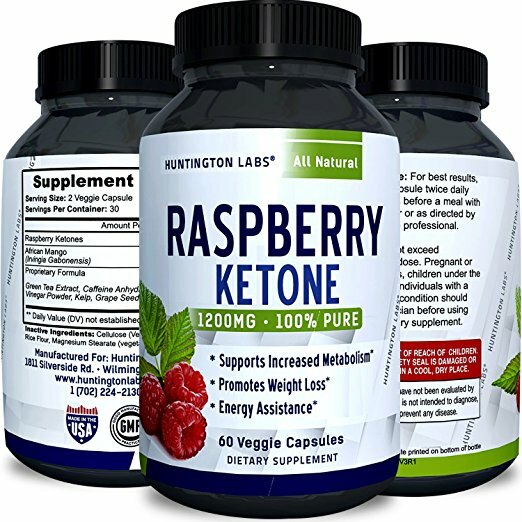 For a raspberry ketone supplement, you should typically expect that the raspberry ketones account for the highest concentration. Offers a higher dosage of ketones at 500mg. The product contains no fillers. Must take two capsules for a single serving. Combined ingredients make getting a clinically effective dose more difficult. This is one of the supplements that contain apple cider vinegar. While it's best to down some of the apple cider vinegar on your own, this does offer a good option for those who worry about their teeth. Apple cider vinegar is an acid, and it can weaken the structure of your teeth if it makes contact with your teeth. However, this supplement is designed to reduce possible stomach upset, and it's a great option for those who are happy with the 500mg dose of raspberry ketones. Can be taken 30 minutes before a meal. Dosage isn't high enough to match studies. Too many ingredients to safely increase the dosage. If you double up on the capsules, you'll effectively get a supplement that gives you the equivalent of two shots of espresso. This will bring you to 200mg shy of the twice daily dose of 2000mg. This is one of the only supplements that contains some organic ingredients. While there are other supplements that are organic, they don't work as effectively as this one. All of the ingredients are tested and verified to be of the correct potency. This particular supplement is great for those who don't want to have to take several pills every day, but vitamin C should be added to the product for the best effect. Includes exact amount per serving for each ingredient. Extra ingredients are low enough to double the dose. Doesn't contain any vitamin C, but that is typical for raspberry ketone supplements. A single dose is two capsules, which means you must take four capsules for a clinical dose. 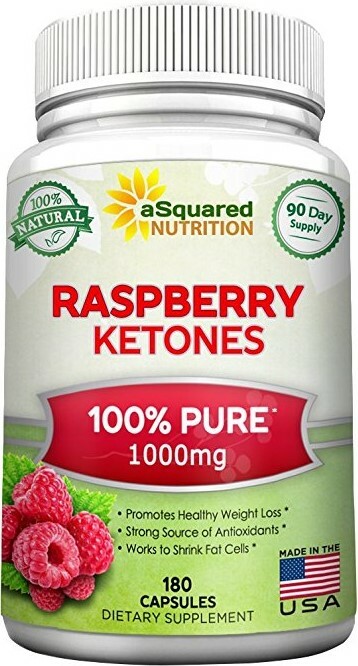 Our absolute favorite raspberry ketone supplement is aSquared Nutrition's Raspberry Ketones. The product is pure and contains only raspberry ketones. None of the products reviewed contain the same ingredients used in the study. Additionally, many multivitamin supplements contain the extra ingredients that were used in the study. Because of this, it's best just to get your daily dose of pure raspberry ketones. Since there is no caffeine or other stimulants, you can also take this right before bed and still fall asleep. The product is made in a facility that is approved by the FDA and certified GMP compliant. While we would be happier if the product was organic, none of the organic products contain the right dosage that matches the studies. This product should help you prevent weight gain by suppressing your appetite and by making a positive impact on your lipid metabolism.